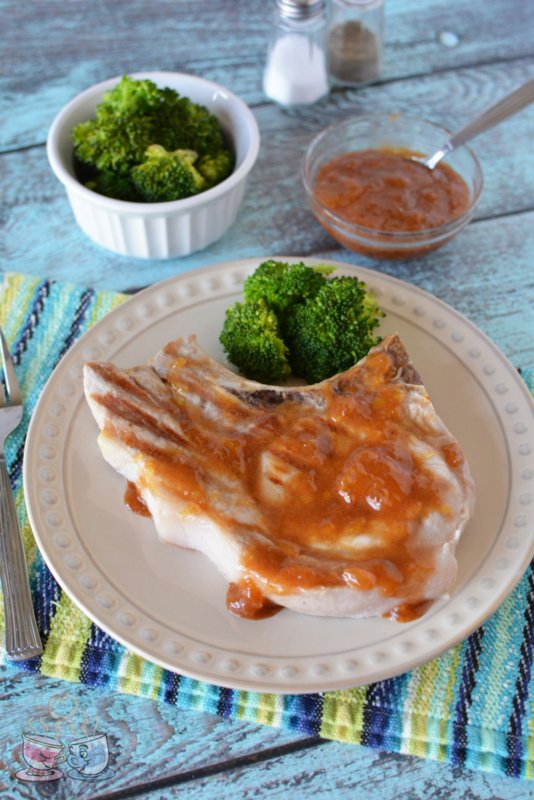 This Grilled Pork Chops with Cinnamon Peach Marinade recipe was brought to us by our friend Kari from Craft Create Cook. I love when my friends share healthy recipes here on our site! So often, I get stuck in the rut of cooking the same things over and over again. Others often have different versions of classic foods, and this is an ideal example. This post contains affiliate links for Amazon and Tupperware. I earn a small commission through purchases made via these links. 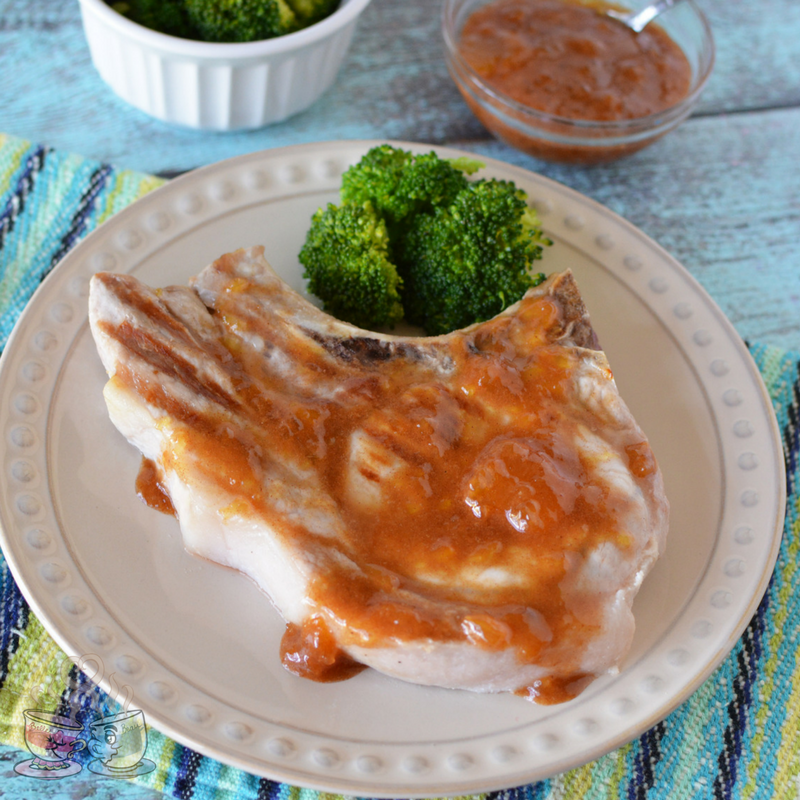 The guys really love pork chops, and while I am not a big fan, I grab them on sale at Aldi all the time. Yes, I am the odd duck that isn’t a big fan of pork. So, making pork chops isn’t always a favorite for me. Kari made this recipe recently, and I decided it had to be shared here since it is a healthy and tasty option on Weight Watchers or any diet. Preheat outdoor grill to medium heat. Season pork chops with salt and pepper and place on the grill. 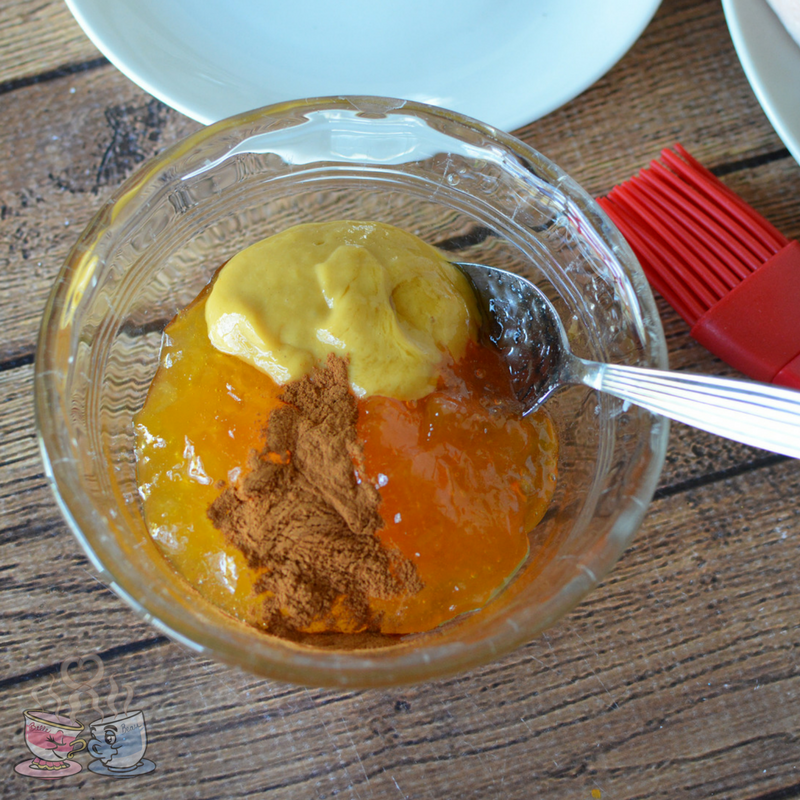 In a small bowl, mix together peach preserves, mayo, mustard, honey, and cinnamon. Grill pork chops for 6-8 minutes on each side, depending on the thickness. The last 2 minutes spread peach glaze onto one side of the pork chops with a brush. 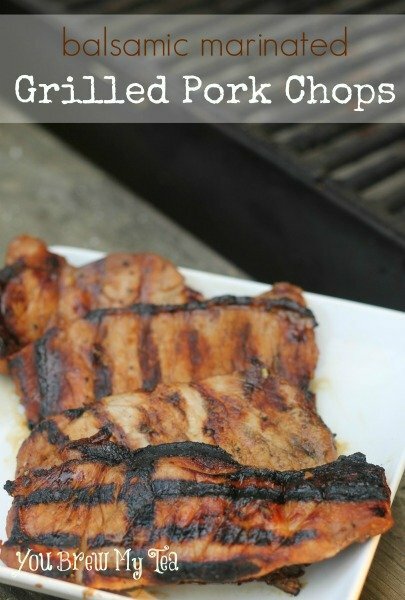 Remove pork chops from grill and serve. Living in Michigan means that grilling outside in the winter isn’t so easy. So, if you don’t have access to a grill outside, you’ll want to cook these indoors year round. I have a Chef’s Choice Indoor Grill and love it, but another great option is the Hamilton Beach Indoor Grill. They are both great tools, and give you a chance to grill any time of year, regardless of the weather. Another popular option is the Tupperware Micropro Grill. It’s a wonderful multi-use tool and cooks or grills right in the microwave. While I am not directly associated with Weight Watchers, I am a current member. I love the program and flexibility it offers. 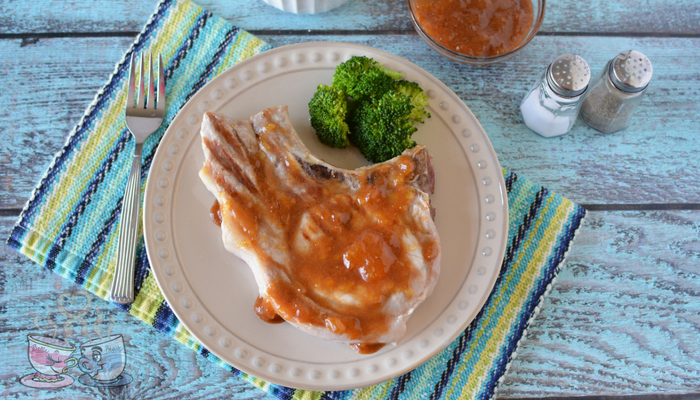 This grilled pork chop recipe with a tasty peach and cinnamon glaze is a great meal that the whole family would love. 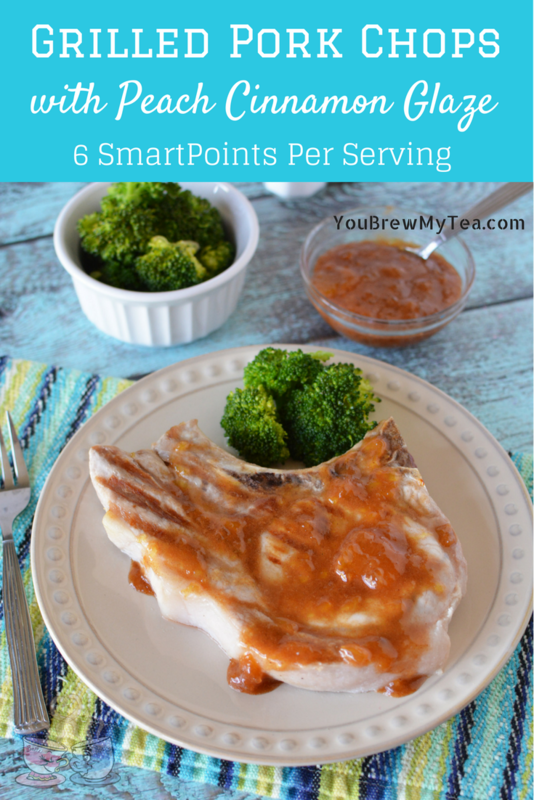 For only 6 SmartPoints per pork chop, you can serve with a large salad or steamed veggies and still fit into your daily points allowance. If you aren’t a member of the program but want to follow the points system, I recommend checking out my tips and suggestions within my post about how to do Weight Watchers online. There are tons of tips there to keep you on track, and also suggestions on how to manage without spending a ton of money. 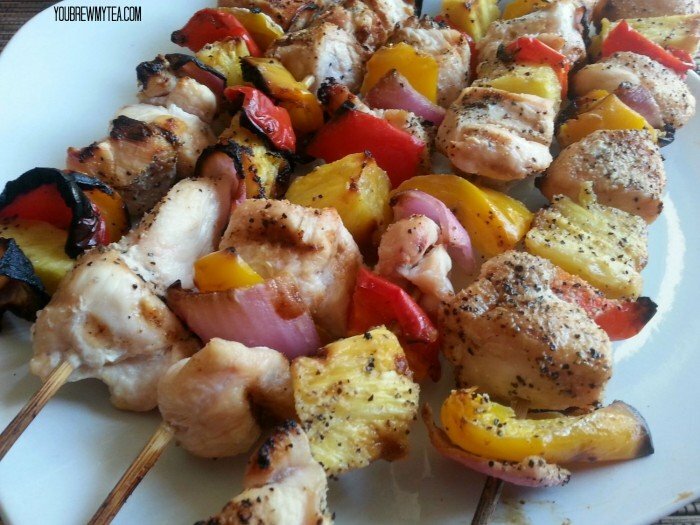 This Hawaiian Chicken Kebab Recipe is one of those meals that is so easy to create it’s almost embarrassing. We love grilled foods, and especially grilled chicken. Adding some veggies, fruit and great seasonings to the mix makes a simple meal that is fun to eat and of course a healthy option. I have played with making kebabs many times in the past, but usually found the meat a bit too dry, or under done. This time I worked harder when cutting the chicken to get even sizes as well as making it a bit smaller/thinner so it would grill faster while not leaving raw veggies. You can use any vegetables you wish, but we chose red and yellow bell pepper, red onion and fresh pineapple chunks. I wanted to add cherry or grape tomatoes to this, but we couldn’t find any nice ones that were organic when shopping so I skipped them this time. I usually grab my boneless skinless chicken breasts from Zaycon since they have antibiotic free breasts for as low as $1.89 a pound on a regular basis. When I get a large batch like that, I always divide them up and leave some whole and some cut into small pieces for things like this dish. I cut the chicken into 1-2″ pieces. This usually makes them small enough they cook through while leaving your veggies done but not burned. As you can see in the picture above, I had a few veggies that cooked more than others. I like them a bit crispy, but would prefer to have them just lightly grilled. We often use a BBQ grill mat to keep things from burning on the grill. I make a simple seasoning blend, but also marinate the entire kebab in a mix of orange juice, pineapple juice and teriyaki sauces before seasoning. I find it gives them a nice flavor that is reminiscent of many Hawaiian dishes. I prefer using wooden skewers so we can simply recycle by throwing into our kindling box after we are done eating. Others love metal skewers that can be reused. I hate doing more dishes so I go the easy way. If using wooden skewers, make sure to soak them in water for about an hour before assembling to keep them from catching on fire on the grill. Soak wooden skewers for 1 hour in water. Marinate chicken in orange juice, pineapple and teriyaki for 1-2 hours. 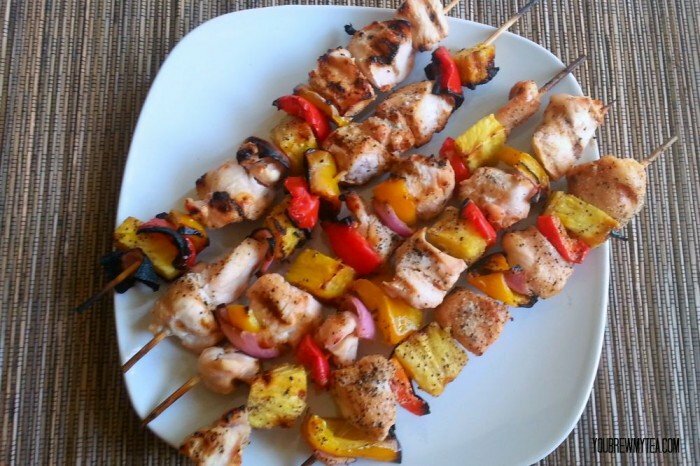 Slide vegetables and chicken onto skewers alternating meat and vegetable. Ideally you want 3-4 pieces of meat and 2-3 of each vegetable. Mix together in small bowl: garlic powder, onion powder, black pepper, salt and ginger. Sprinkle seasoning blend over kebabs. Coat all sides lightly. Cook on grill over medium flame for 5-6 minutes on each side. Depending on grill type and ability to control flame you may need to monitor these the entire time to make sure they cook evenly. Use meat thermometer to make sure chicken is cooked through. 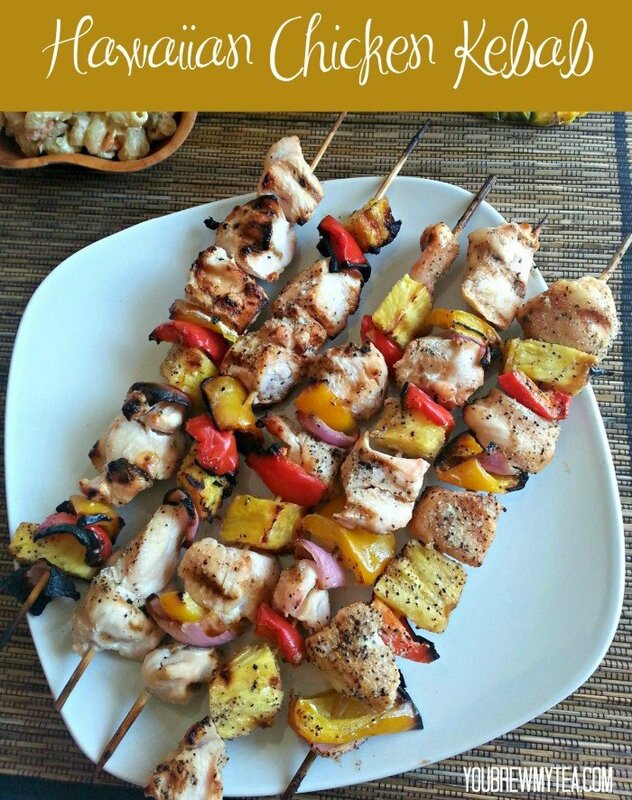 This Hawaiian chicken kebab recipe is one of our favorites to pull together and throw on the grill. 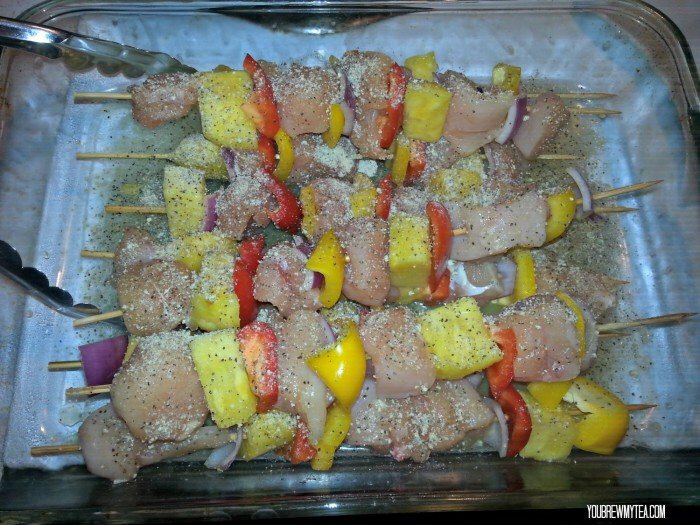 Kebabs also help stretch your meat budget a bit father since they include so many fruits an veggies on the skewer. We served ours with a yummy pasta salad, but you can serve over rice, with a pita and hummus or even sweet potato fries for a full meal! Check out some of our other favorite chicken dishes for healthy and easy meals for your family! 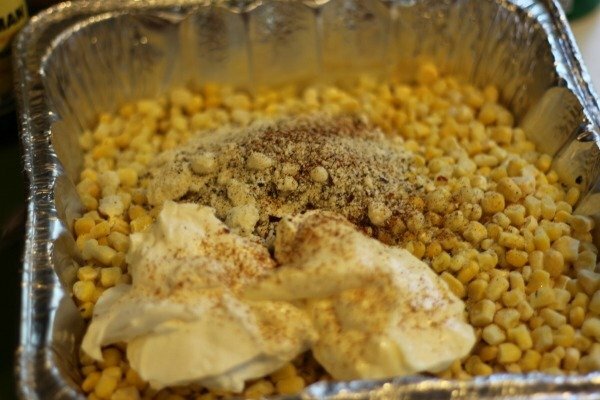 Combine corn, mayonnaise, Parmesan cheese, Greek yogurt, cayenne pepper, and black pepper in a large bowl stir well until all ingredients are combined thoroughly. 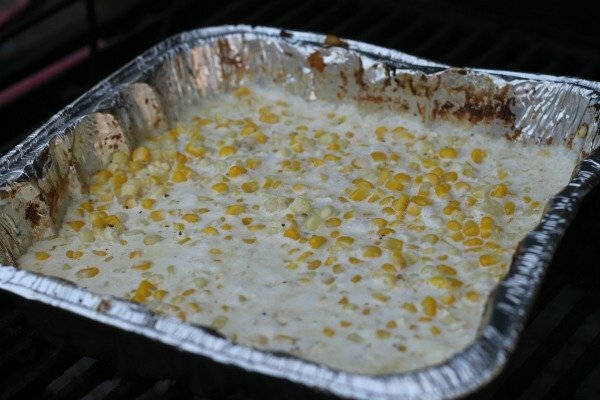 Pour into a disposable 8×8 pan- you can use a heat-safe disposable pan from your kitchen but this makes clean up a snap after your cook out! Heat on top shelf of grill, bottom is fine if you don’t have 2 racks, I do mine this way so our meat and other items can cook at the same time. Heat until warmed all the way through and ingredients have melted together. Place in grill-safe cooking pan or dish and cover tightly with aluminum foil. Cook for 5-7 minutes or until heated through and all ingredients melted. Preheat oven to 375 degrees and spray pan with nonstick spray. Mix all ingredients together in a large bowl and pour into prepared pan. 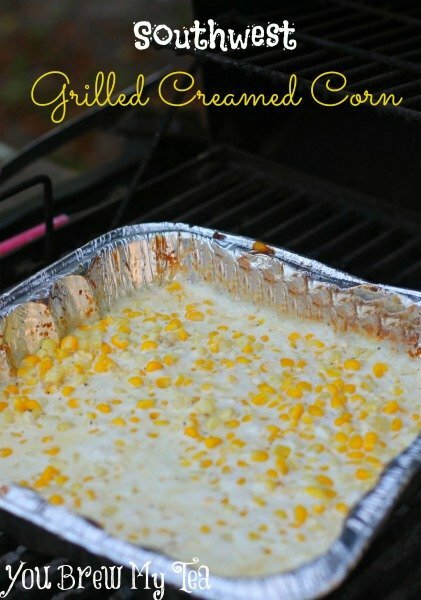 This is a delicious side dish to go alongside your favorite grilled meats this year during BBQ season. We love to eat this alongside our Balsamic Marinated Grilled Pork Chops with a large side salad or some fresh grilled squash and zucchini! These Balsamic Marinated Grilled Pork Chops are just the thing when you want a change from burgers and hot dogs on the grill. 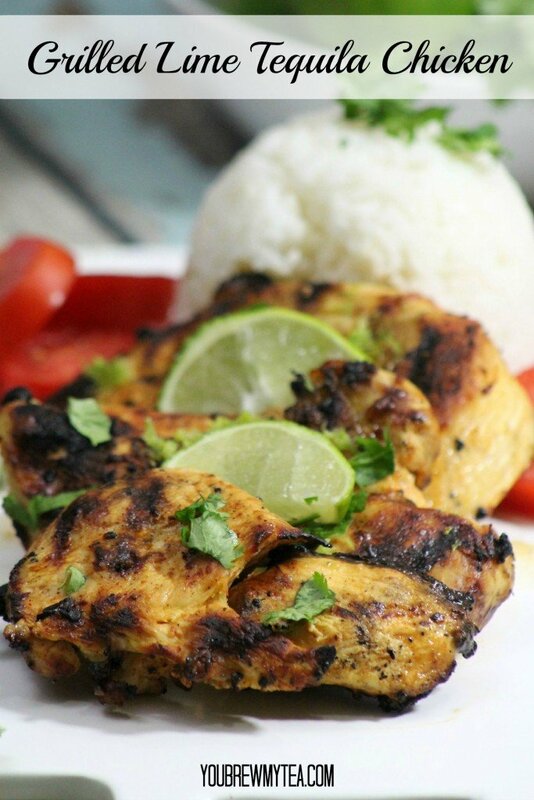 Infused with flavor a rich marinade they are tender and delicious- the perfect warm weather main dish. 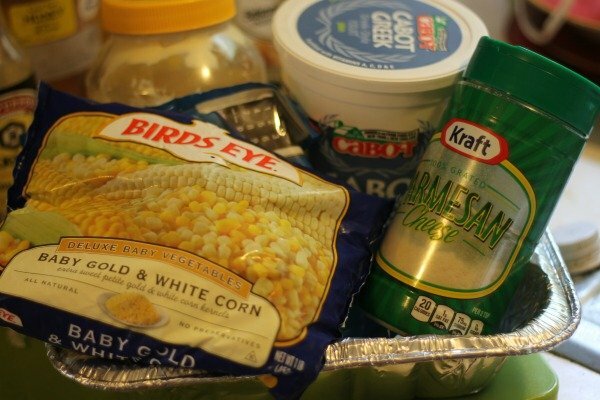 Add baked potatoes and a green vegetable, or cream corn to round out this tasty meal. Simply whisk up the marinade, place it all in the fridge while you work on the rest of dinner then toss them on the grill for lip smacking pork chops that will please the whole crowd. Since I am currently doing Weight Watchers, I have added in the points values for you for this recipe. 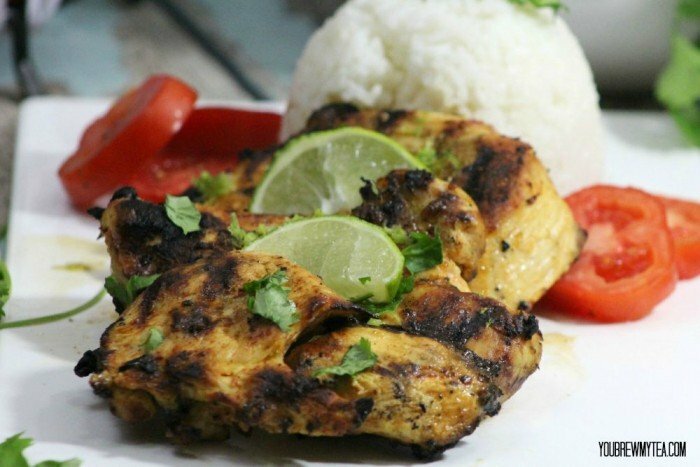 The marinade adds tons of flavor with very little point value. I calculated the recipe in the Weight Watchers Recipe Builder since I am currently on the plan. I’m not associated with Weight Watchers, but I love the program and love sharing recipes that have been adapted to be healthier. You can also grab the Weight Watchers SmartPoints Calculator to use for calculating points. It’s handy, and a great way to focus on the program without spending that monthly fee. 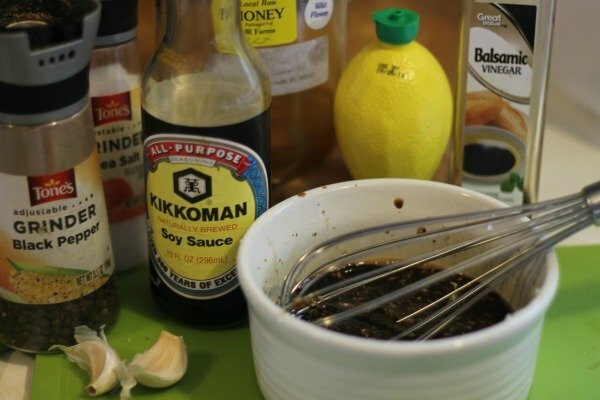 Whisk together soy sauce, lemon juice, balsamic vinegar, honey, garlic, and pepper. Pierce pork chops all over with a fork to prepare for marinade. 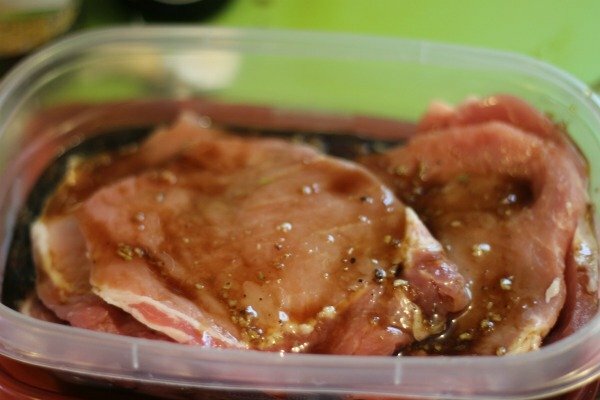 Place pork chops in gallon ziplock back or large plastic container with a lid and pour marinade over top. Place in refrigerator for 45 minutes to 2 hours, shake occasionally to distribute marinade. When grill is heated up and ready (or you can pan fry indoors with a bit of olive oil) cook on each side for 5-6 minutes. As soon as the weather turns nice outside, we always fire up the grill. 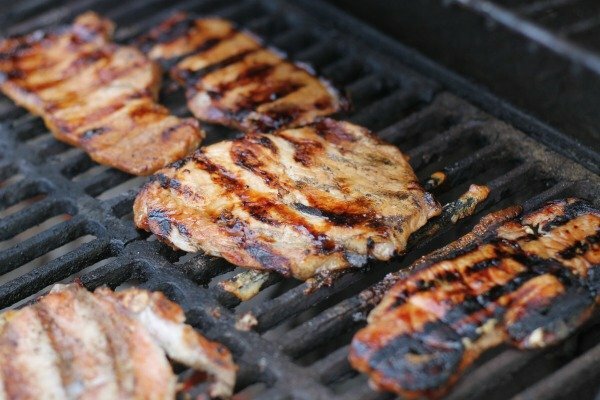 Whether it is grilled meat like these tasty balsamic marinated grilled pork chops, or our favorite burgers and brats, grilling is always a favorite for our family. 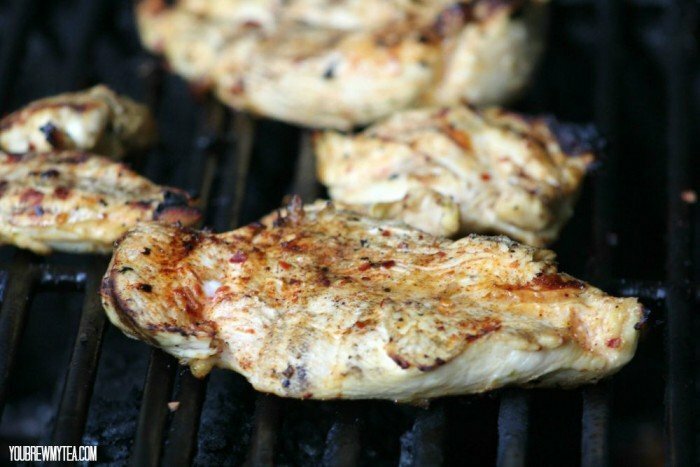 Check out some of our other favorite grilling recipes and side dishes!